Susan Today: What Do You Let Them Watch? Or perhaps the more appropriate question here is what do you watch when they are still awake? My friends and I were recently having this discussion, so I thought I would post it here as well. Most people I know are very conscious about what the children watch. Here, we limit violent shows that might seem harmless to a 5 year old, but I can tell you that shows like Power Rangers are not my friend. At least in my household, they result in immediate reenactment of scenes, which often end up with an injured younger sister. Not good. We also avoid the animated shows that really are designed for adults - AKA Sponge Bob, Family Guy, South Park, etc. But what about the PARENTS television consumption while the kids are present? For me, honestly, it isn't a huge issue. I don't really watch TV. Now that we are limited to antenna channels or Netflix, I watch even less. Before, I was prone to home improvement shows and sports. I do have a perhaps unhealthy love of the show Nashville, and reserve that for my tub TV time and a glass of wine. No kids allowed there for sure! Sometimes, I have to remind the Mister that watching a "beat 'em up, shoot 'em up" movie or one with adult themes is probably too much for K-man's mind in particular. He doesn't like it much, but he also agrees. What I am wondering about more though are sitcoms. When we were young, we would watch shows like The Cosby's or Family Ties, together as a family. However, they were also largely FAMILY oriented shows. Both were about families, had small children in them and on at a time that worked with my bed time. 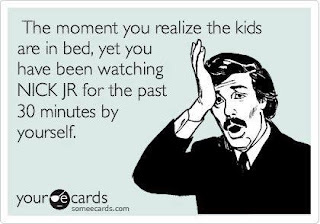 I have seen reruns in recent years and there are lots of adult themes to them too. Of course, now looking at the time the show aired... it started in 1984! I was 10, not 5 years old. No wonder I was allowed to watch. And they started at 8pm, past my 5 year old's bedtime. I enjoy some of the sitcoms, when I choose to watch any - Last Man Standing, Big Bang Theory, Guys with Kids. But I can't think of a single one that I find appropriate for my kids... yet. They have moments that my kids might get, but for the most part, the story lines revolve around relationships... ahem between men and women, if you get what I mean. Most people I know agree with me, but I know there are some that feel like they watch whatever and the kids will eventually, so who cares? I figure while I have the opportunity for some level of control, why not? It isn't like we have to forgo watching them all together thanks to the fabulous advent of DVRs. Record all you want, and watch when you want... after the kids are down. Of course, this is what usually happens LOL. What do you do in your household? Our "family" shows are pretty much on Disney. Like Ant Farm, Good Luck Charlie, etc. The 3 year old and 11 year old like them. Those I kind of relate to Cosby Show. Unless I am watching them for the 10th time, I can handle them. That and Wipeout, the kids love that! Everyone keeps mentioning Wipeout. I think we might have to watch it sometime. I think it reminds me of the original Dallas - part of its appeal! We do not watch shows that have content inappropriate for the 5 year old and under crowd while the kids are awake. We LOVE Big Bang Theory, but that show is certainly not appropriate for a 5 year old. Same deal with Scandal. Oh how I love Scandal! But alas, that show waits until after the kids are in bed and far from the television's range. We have had an issue with the boys watching shows that we find inappropriate while they are with other caregivers and we have had to undo some of the antics they picked up watching those shows. So now we are sure to give caregivers a heads up on which shows are and are not permitted. Apparently some people fail to realize that not all cartoons are appropriate for the preschool crowd. Oy! As for Wipeout, you should totally check it out. It is available on Netflix. I can see how that would happen. I remember telling sitters early on that Sponge Bob wasn't for 3 year olds :). We did check out Wipeout and he loves it!